This article will concentrate only on high performance grid implementation using jQuery,JSON, .net,Linq.Most of us in our career face a situation when we want performance intensive i.e solutions where high performance is the topmost priority. In such scenarios Gridview,Repeater and all other server side controls are far too much of a thing and above all if you want paging,sorting and filtering functionality also in them, then instead of becoming high performance it just becomes a creepy solution which we want to say as high performing because we couldn't find out any other solution in the give amount of time. In this article i will cover almost every aspect which is important i.e "Paging" , "Sorting" , "Filtering" data on basis of columns.Although many of us are using already available handy solutions whose family include Telerik Rad Controls,Infragistics Controls or DevExpress on the server side and other solutions such as Ingrid and FlexiGrid which are very popular as client side data grids.So the goal of this article is to achieve the same functionalities which other client side grids achieve. Having your own code with all the scripts written by you and every stored proc which you can understand will give you a lot more confidence in achieving what you want.This little effort will prove far more better then the tedious task in what others have implemented.Here i would like to be as simple as i can although some stored procs might seem a little complex but mind you if you consider yourself a so-so kind of a guy for SQL and stored procs then they are just a piece of cake. This implementation is very simple and just act as a beginning to others who want to implement their own logic.First step is always the hard step, so i m trying to provide that first step,although very basic but this article will solve really complex problems.Also this article is not intended to compete or compare with any of the above mentioned controls, it just speaks of how simple things can be achieved in simple ways. Creating a stored proc which will support paging. Creating the business objects to retrieve the paged results and also total records this will be a little complex object for JSON to understand but there are very easy ways which we will discuss to achieve this. Creating a DAO or Data Access Layer which simply consists of a DataContext based call to this stored proc. Creating a Service Layer function to call this DAO implementation of the Stored Proc. Calling this Service Layer Function from our Page.Here we are using WebMethods to demonstrate this example, i would prefer you to use WCF Restful services but here i m using this just because there are very few examples using WebMethods and several examples using Web Services,although WebService way is far more better but if you want things to be simple and not want the hassle of extra security for the WebService layer , or your client does not want a web service model then WebMethods approach would be the only other good alternative. Calling this WebMethod from built in jQuery ajax functions to get a JSON response from the server. That's all what you need to do while implementing your own grid. This is the whole stored proc actually what you need for implementing paging,sorting and filtering. Let me go deep and explain what it does.It takes 6 input parameters and one output parameters. @pageNum refers to the current page no which we will pass every time from the UI.If our current pageSize is 10 on every call we will fetch only 10 records which is very good as far as performance is considered.Another approach here could be to fetch every record from the Database and then use Linq in your application level to fetch 10 records only at your client end.This second approach can be very handy if you are trying to make a generic client side control with this implementation,but if you have full control over your Database and stored procs i.e if you are developing whole application for your client from UI to Database then the approach i have discussed would be the best but if you dont have access to modifying and creating the stored procs then you can use direct Linq to get the limited amount of records from application layer to the client.In both cases the data brought to the client side would be the same but in direct linq case there will be time lapse in bringing huge data from Database Layer to application layer.So you can also use this second i.e linq approach if your application and DB both are running on the same server.But anyways i prefer the first modifying the stored proc approach because it is the best. @pageSize is the total no of records you want to be displayed per page. @sortColumnName is the name of the actual column which you want to sort.From the UI we will pass this name by catching which column was actually clicked. @filterStatusId this is my custom implementation which is very specific you can extend it very easily,i couldn't get time to implement this may be one of you can implement it and share the code here. @advertiserAccountId this is a custom parameter which is passed to retrieve the campaigns related to an advertiser. @totalRecords this is an output type parameter which always returns the total no of records which are required for paging. This declares a temporary table which will hold all the actual sorted and filtered records which we will join with the original table and implement paging by providing the pageSize and pageCount logic and retrieving only required amount of records. 2. This includes selection of all records in temporary table based on sorting inside the order by clause.Here we are passing sortDirection based on which the records are sorted either ascending or descending.This is the most important part of this stored proc. Filtering is straight forward but sorting is little typical because you cannot write like this Order by @passedparameter @passedSortDirection.This will result in errors. This is fairly simple, if you are lazy just drag and drop your stored proc in your dbml file and see the designer.cs file for the code.Actually here i am having different data context and i m not using the Linq dbml file at all , i only mentioned it to just help in easing and creating the required code for the stored proc. The better approach would have been to use WCF Restful services which can return result in both XML and JSON formats. Another reason is in your specific implementation your client does not want to use the WebService way then these WebMethods can come handy. 8. Calling this WebMethod from built in jQuery ajax functions to get a JSON response from the server. I have wrapped the $.ajax() jQuery function for Generalizing it to be used with any method and you need not to duplicate it every time. jTemplate is a really very cool and interesting templating engine available out there only problem with this is that its python style syntax may confuse you.But i found it really very powerful. I have personally chose jTemplates as i was using jQuery and i was not using Microsoft Ajax at all in my approach.But ups and downs are always there,anyways you can choose anything.But if you are following a approach in which you don't use Microsoft Ajax Framework then jTemplates is the best approach to go. Major Benefits of using templates is that you can have full control over your rendered HTML and you call only data on the page not the html from the server. This actually is the main drawback of using the update panel as such in your applications update panel by default brings all your markup as well as data again from the server.So if someone out there is using Update Panels be careful while putting the controls and other content inside the update panel. LoadPaging actually initializes the the paging functionality and here we set the pageCount and call the setCampaignPaging() function which checks if the currentPage is the first page or the last page this is to disable and enable the previous and next buttons. CampaignNextPage and CampaignPreviousPage are used to navigate to previous and next pages in the list. ApplyTemplateCampaign(msg) by doing this we are calling a function ApplyTemplateCampaign(msg) and in this function we are passing the results received from the server. Given above is the actual implementation of the template which will be rendered inside the div.In above code i have shown how to read the complex object returned from JSON. 10. That's all what you need to do while implementing your own client side grid with paging,sorting and filtering functionality. Live Demo Page for the implementations shown here - i am working on a live demo page for the implementations shown here. More generic form of this control which i will make once i get time. Making the NextPage and PrevPage Functions more generic to accept the function name to be called and then calling that function only(if any of you implement this plz share here), i will do all these but it may take some time for me as i m very busy with my schedule. If any of you have time and implemented the functionalities do share here as it will help many more people. Annotate is a very important feature of Visual Studio Team Foundation Server which most of us ignore while developing our applications and working with the Team Foundation Server.Annotate Feature allows us to see changes which occurred in a particular file with respect to a particular change set.It will show you all the change sets and you can click on any change set to view what exactly it did.This is a very useful feature when you are working in a team and you are working on a particular file and unable to understand what changes your teammates have actually caused in that file. Annotate feature was not available out of the box in VS2005.It came only when you install the Team Foundation Server Power Tools. But in Visual Studio 2008 Team System with Team Explorer this functionality is built in,if you are working on any team project and want to use this functionality just right click any file and from the menu just choose "Annotate". After clicking this option the file will be opened in the IDE with the change set numbers stated first followed by whom the change set was triggered and the date on which the change set was triggered. If you click on any particular change set then this will open the full information about that change set in the above example i clicked on the change set 4424 so it opened the change set information window 4424 for me. This approach can be very useful if you just want to look at the changes made to that file within the IDE, this comes very handy when you are working on that file and want to see who has modified it and for what reasons and what changes your team members have made. 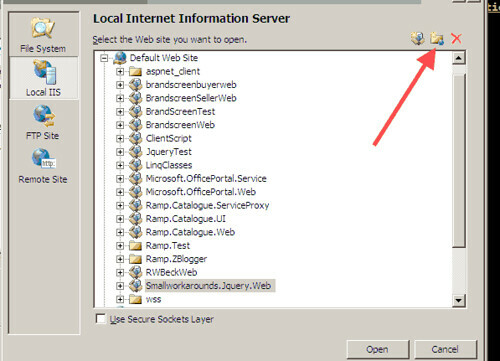 How to create a new website which resides inside your solution folder as a web project but is automatically mapped to the IIS.Benefit of this approach is that we will be using IIS as the web server to run and debug this website not the Cassinni web server which is the default in Visual Studio.Another benefit is that we will escape the problems caused by the port no's which Cassinni bring by default.Some of us who prefer to use Cassinni can go on with it no probs!! !.But personally i like that each of my website in my project is mapped to a virtual directory in IIS. Another benefit of creating IIS mapped website's is that when you share you code and other people open the solution then it automatically creates a website on the localhost no need to again map it to open with IIS.So given here is a step wise process along with pictures to illustrate how it is done. I personally prefer to add a blank solution and then add new website's and projects to it,you can go other way round by choosing to create a new website with the option in Project And Solution in the Options menu in VS2008 to always create a solution for a project or website.By default Visual Studio will not create a solution if you only add a website. Now right click on your empty solution or solution to which you want to add the new mapped website.It will ask you few options and there will be a drop downlist also from where you can select where you want to create new website. Now it will ask your for Alias Name and the Folder,just go and give any name what you want your virtual directory to be named as and the map it to the folder where you have initially kept your solution. Press OK that's it now everytime when you click open your solution, it will check for the virtual directory if its there then well and good if its not there it will automatically create one for you. Sometimes we need to create an empty solution and add new projects to that solution.This approach comes handy when you first just want your empty solution within a folder structure and then you later want to just add new projects to this solution. 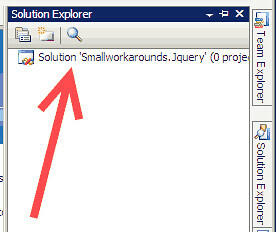 1.One possible solution is to Enable "Always Show Solution" in the Projects And Solution Tree inside the Options in Visual Studio.If you enable this then whenever you create a new project a solution will also be created for you with that project.This sometimes is a problem when we create only a single website and want a .sln or "solution file" to load that project. 2. 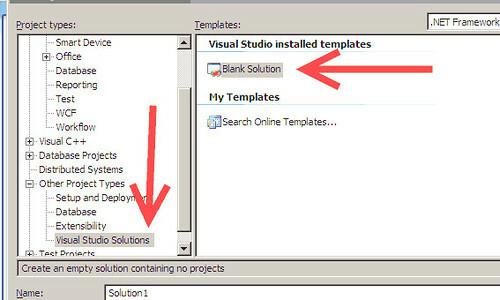 Another approach is just navigate to Other Project Types and in that go the subtree "Visual Studio Solutions" and here you will find "Blank Solution" template, this will open for you a blank solution into which you can add projects. Initially there will be no projects loaded as we have not created any project.Just right click the solution and go to Add and then add new project,add new website, add existing project,add existing website what ever you feel like. Master Pages in asp.net Content Page Title not Changing a beginners nightmare!!! If you are trying to change the title of your content page and its not changing and always showing "Untitled Page" then you are probably committing a stupid mistake. Here i will tell you what mistake are you doing and how to rectify it. If you are working with old asp.net versions then it will not insert the content place holder in the head section of the master page.It will only insert the content place holder in the body section of the master page. Also by default there will be a title entry in the master page <head> section, this is the entry which will always be shown no matter whatever title you give to your content page. <%@ Master Language="C#" AutoEventWireup="true" CodeFile="CatalogueMain.master.cs"
Next make sure that you delete the <title></title> from the head section of your masterpage. Thirdly make sure that while creating a content page in the extreme right of the bottom of the selection wizard you select "Select a masterpage". This will automatically create two content place holders for you if you already have put those two in your original master page. So now go ahead and put the title as anything .......And that's it run your content page and you will see the title applied. This was a very simple workaround and was meant only for beginners who sometimes get confused. Thanks to Lee as i forgot to mention this method. Just in the content page in the @ Page Directive in the Title Section provide a valid Title and this will become the title for your content page. Sometimes while developing we have situations when earlier fill some dummy data in our database in earlier stages of development using some data generation tools such as RedGate Sql Data Generator or EMS Data Generator. This approach is good when we are in initial stages of kick off stages of a project, also after sometime we want to check some related and sensible data so we want to fill the data ourselves, thus now we want to delete all old data from the databas. Given below is the script which will let you delete all the records in the database and also preserve your referential integrity and also can reseed each table to their initial values. This piece of script disables the referential integrity and deletes the data in all the tables. This script again enables the referential integrity on all the tables. This script reset all the seed to their initial values.If you don't want to reseed your tables to initial values just skip this script. Given below is the code put together for your convenience to use.